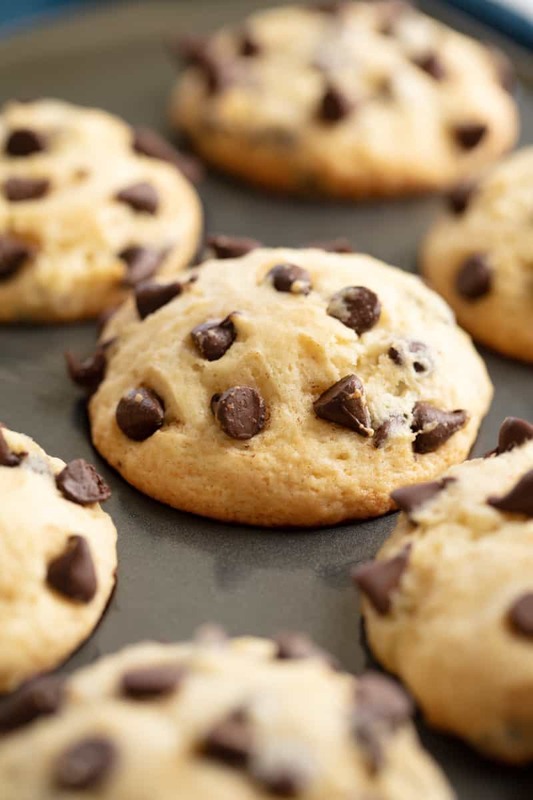 These Easy Chocolate Chip Muffins are just like mom used to make! The batter comes together in just minutes for an easy muffin that’s perfect for breakfast or brunch. How do you keep muffins from getting soggy? There are two great ways to keep your muffins from getting soggy. With either method, you’ll need to first ensure that your muffins are completely cooled before storing in an airtight container. You do not want the muffins to have any residual heat. The first option is to simply add a few saltine crackers into the airtight container that you store your muffins in. The crackers will absorb the excess moisture. The second option is to lay a paper towel out onto the bottom of your storage container. Place your muffins in on top of the paper towel in a single layer, then place an additional paper towel on top. The paper towel will absorb the excess moisture. Can I add nuts to my chocolate chip muffins? Yes, you can! When you add in the chocolate chips, you can also add in 1/2 cup of finely chopped nuts. Almonds, walnuts, or pecans will all work great in this recipe. Yes, you can! Muffins freeze quite well. Just pop them in the freezer. Once frozen, store in an airtight container to prevent freezer burn. How do you make perfect domed muffin tops? They key to a perfectly domed muffin top is to blast the batter with heat when you first place it into the oven, and then let it finish baking in a slightly cooler oven. This will cause the steam in the muffins to rapidly release, making the muffin puff up rapidly and create that perfect dome. 425 degrees Fahrenheit is a great temperature to start your muffins in. After about 7 minutes, reduce the heat in the oven to 350 degrees F. Watch your muffins closely as they finish baking as ovens vary slightly so your cooking time may vary as well. Pull your muffins out as soon as they are golden brown on top. These Easy Chocolate Chip Muffins are just like mom used to make! The batter comes together in just minutes for an easy muffin that's perfect for breakfast or brunch. Line a muffin tin with paper liners. Lightly grease paper liners with nonstick cooking spray. In a large mixing bowl, use a hand mixer to cream together butter and sugar, about two minutes. Beat in eggs until combined. Add in the baking powder, salt, and vanilla and mix briefly. Add in half of flour, mix with hand mixer until just combined, then add in the milk, stirring to combine. Scrape the bottom and sides of the bowl and add in the remaining flour until just combined. Add the chocolate chips to the batter and use a rubber spatula to gently fold them in. Divide the batter up amongst the 12 muffins. Preheat oven to 425 degrees. Let the batter rest while the oven preheats. Bake in the preheated oven for 20 to 25 minutes, until a toothpick inserted into the center comes out clean. Reduce the heat in the oven to 350 degrees after 7 minutes. Watch the muffins closely as cooking times may vary depending on your oven. Let muffins cool for 5 minutes in the pan before removing them and transferring to a wire rack to cool completely. I made these for my family and they LOVED them. It’s only a day after I made these and they are already gone! I think this recipe is a keeper and that this is the best!! 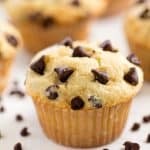 I just made a batch of these this morning and they are simply the easiest, most delicious chocolate chip muffins EVER! So tender and fluffy. I literally had them in the oven in about 10 minutes. Doesn’t get any better than that. This recipe is a keeper. Thanks for sharing. Yes, this recipe can easily be doubled for 2 dozen muffins. Very scrumptious. They puffed up beautifully. These muffins were easy to make. My 10 yr old daughter made them for our breakfast this morning. Made these for my kids this evening and they were a hit. I used oil instead of butter but they are still super yummy. 1. Could I use melted butter? 2. Could I use vegetable oil? The recipe calls for 1/2 cup of softened butter. If you choose to alter the recipe you will get different results. The measurement of fats will stay the same. Such delicious muffins! NowI’d like to make some only dairy free for my granddaughters. What kind of milk do you recommend I use, almond, cashew, or soy? Thanks for your help. I would use almond milk. I used a gluten free flour and all the chips sunk to the bottom. Is that because of the flour? Hard to guess. There’s so many different gluten free flours out there and this recipe is not designed to use them. I read somewhere that it is good to let the batter sit in the refrigerator for at least 30 minutes before putting it in the oven. Overnight is best. The article was about tricks to make bakery style high dome muffins. Have you ever tried that? Yes I have and it didn’t make much of a difference. I made this recipe and it was delicious. I used powdered sugar because I didn’t have any other sugar. lol. It was still a success. Have you ever made this recipe into mini muffins? If so any tips? They will take less cooking time. For mini muffins, is it still going to be 425 F? The temperature doesn’t change, just the time needed to bake. I make mini muffins all the time for my toddler. They are cooked in around 6-8 minutes. Can you substitute bananas for sugar in this recipe? 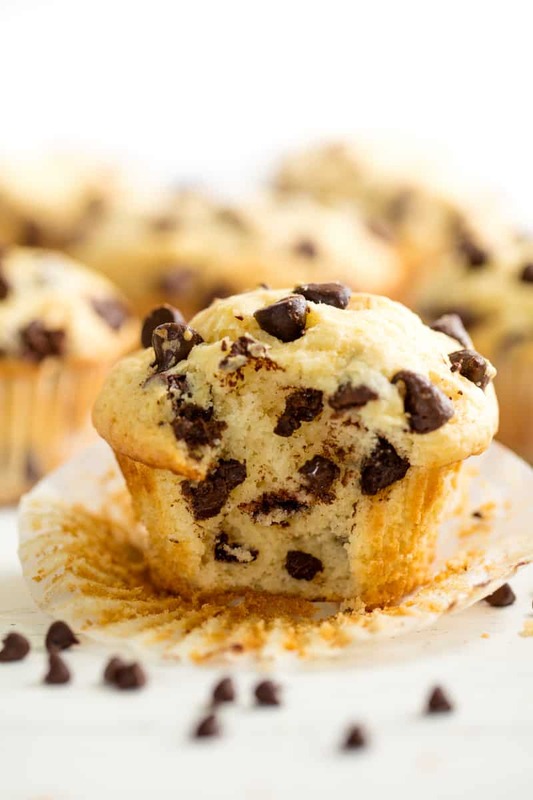 I love the idea of choco chip banana muffins. What do you think? Bananas are not a good substitute for sugar. Your video says to bake them at 425 for the entire time and the written recipe says to reduce the heat from 425 to 350 after 7 minutes. Which do you recommend? Reduce the heat after 7 minutes. Hi Rachel just wanted to say I love all your tutorials they’re great and your recipes are awesome I cannot wait to try this new one when you say drop it after 7 minutes to 350 I am assuming it’s after you put them in 7 minutes later you dropped the temp to 350 degrees not 25 minutes later correct?